OM-D E-M1: How does the first "Pro" Micro Four Thirds look to an amature photographer? 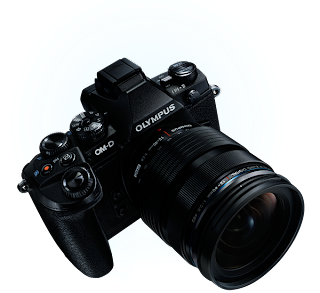 The OM-D E-M1 is now selling, along with the lens M.Zuiko Digital 12-40mm F2.8 Pro. The E-M1 can be considered the first true micro four thirds pro level camera, due to its weather sealing body and lens and general all around features. One thing I have always liked about the Micro Four Thirds and Four Thirds format is the aspect ratio of the image. 4:3 is a ratio that I happen to feel very comfortable with, expecially when taking photos vertically. I use my APS-C cameras in 4:3 mode, sacrificing the pixels on the left and right of the sensor. Another thing I like about the Micro Four Thirds system is the assortment of beautiful non-zoom lenses. I love single focus lengths and Micro Four Thirds has all the focal lengths I like, and the three I need are wide (12mm or 14mm), normal (17mm or 25mm) and tele (45mm, 60mm, or 75mm). A little bit of disclosure, I majored in Physics, have a strong knowledge in Optics, and I can design a camera lens, although I've never done anything to the level of the interchangeable camera lenses we see on the market. And in that order as of this writing. AF Speed and/or AF response, with Dual Fast AF of contrast AF and on-chip phase detection AF, is a first for Olympus. As a crude explaination, phase detection AF not only knows that you are out of focus, but in which direction and how much out of focus you are, so the camera will know which direction to move the lens. Contrast AF only sees a high contrast on its sensor as in-focus. Another by-product of phase detection is the ability to use high quality Four Thirds lenses such as the Zuiko Digital ED 14-35mm F2.0 SWD and Zuiko Digital ED 35-100mm F2.0. Olympus designed these lenses, unlike some other camera compaies, with a much higher optical performance than the camera of its time could resolve. This means that a lot of the Four Thirds lenses stand the test of time as the sensors get better and better. It also means you can buy older lenses in the used market and still get better results than the lower quality lenses that are sold today (although there aren't many low quality M.Zuiko lenses). The camera software engine, TruePic VII and Fine Detail II, which seems to get rid of chromatic aberration and diffraction limit correction. The diffraction limit blurs the images at slower apertures such as F16 and sometimes less, but the E-M1 retains a lot of the detail. So the diffraction limit is physics -- dependent on wavelength and the F/# of the system, you can only make a spot so small, the longer the wavelength or larger(slower) the F/#, the spot is bigger since it is scattered more while passing through the aperture, hence resolution is lower. Since sensor resolution is still getting higher, the resolution of the lens is affected by diffraction even more than the film days. What is amazing about the TruePic VII is that the diffraction limit is different for every lens -- and every focal length of a zoom lens. The most sensible way to go about making a diffracted limited spot sharper is using de-convolution, or by increasing the contrast lost by diffraction. In any case, a problem caused by the laws of physics is -- albeit by software -- broken, and that is an amazing feat in my eyes. The built-in EVF is the best ever, and the same spec as the VF-4. Also interesting is the magnification of the VF-4 is 1.48x, which is much larger than the 1.15x of the VF-2, and also larger than the last Four Thirds E-5 OVF also at 1.15x. I thought that the OVF in the E-5 was very good, much better than most APS-C cameras of its time and even now. I can't say that I'd be climbing mountains and takling photos in pouring rain, but the dust and water repelant body and lens (M.ZUIKO DIGITAL 12-40mm F2.8 PRO) are proof that they are made top quality, and that is an extremely comforting fact to have while you are shooting. Sometimes being liberated mentally can make you take better pictures. I wonder about the naming of the next OM-D cameras, and the impact that the E-M1 will have on future models. My guess would be E-M2、E-M3、E-M6 maybe? The E-M5 was named alongside the EPL-5 and EP-5, but that does make the numbering a bit complicated as the E-M1 successors approach the number 5. There won't be a E-M4, as evidenced by the lack of past models such as the E-4, EPL-4, and EP-4. The number 4 has a negative connotation in Japan, as one of the pronounciations of 4 is a homonym for death. Some buildings didn't have a fourth floor, some hotel rooms didn't have Room 304, for example. As for the impact of future models, specifically the Pen cameras EP-6, EPL-7 and EPM-3 (or whatever model will come after the EP-5, EPL-6 and EPM-2), Olympus generally uses the same sensors as the previous release, meaning if future models are consistent as before, we may get phase detection in the Pens as well. Of course, there is always the marketing strategy of the higher class Pens differentiated by the sensor, or simply lack of supply chain for the phase detection sensor. Of course, the EP-5 for example has plenty fast AF, and if Olympus decides that not many people will use legacy Four Thirds lenses on the Pens, they may not opt to have phase detection for the Pens at all, as I suspect phase detection has most of its benefits for the use of Four Thirds lenses. Some features like 5-axis stability introduced in the E-M5 are only available in the highers end Pen EP-5, but that is more to size contraints. At the very least, I expect the TruePicVII to be implemented since it is a software and chip. Framing and composition, whether you crop the photo afterwards or not, is what makes the photograph speak to the audience. A skilled photographer could show you the subject of the photo even if everything was in focus, or if there is an absence of colour. The composition of the photo guides your eye to where the photographer intends to. As an aside, I try my best to use bokeh isolation of a subject as a tool, and not rely on it too much, only because I love smooth bokeh very much. Focus and exposure are so good now, well represented by the terms AF and AE. Focus can mean the point of focus of the photo, but taken broadly it can also be stabilization, as an out-of-focus subject and a shaky photo both have the same result -- blur. Exposure is important too, and not necessarily the value Program AE will give you, as depending on the photo, the subject you want to make hit the Sunny 16 rule may differ. So considering the above, the E-M1 takes care of the focus issue superbly with its combination of contrast AF and on-chip phase detection AF, and 5-axis stabilization. There are no indications that auto exposure is off, and but just as in most cameras it can be tuned to your liking. All in all the OM-D E-M1 strikes me as a camera that is significantly, but perhaps not substantially above my phtographic needs. I don't make my living taking photos and the most fun I get out of taking photos is when visiting places with great scenery and taking photographs of my children (that move around a lot). Meaning that the E-M1 can handle any kind of photo that I would take, but I'm a little concerned that it may be out of my skill level just enough that I would be wasting the features that are available. Of course, having a camera capable of more I can handle would give me the opportunity to learn the aspects of photography that I'm not skilled at. We will see.